Rinse the cranberries under cool running water and discard any that are wrinkled or soft. Drain and set aside. In a medium sized bowl, sift together the flour and baking soda and set aside. In a large heat proof bowl, stir together the hot water, molasses, and salt. Then stir in the flour and baking soda until well combined. Stir in the cranberries until evenly distributed. Using vegetable oil cooking spray, grease a 9 inch x 13 inch baking pan or a pie plate (I used a glass pie plate). Set up a double boiler or steaming equipment (see here for How to Steam Cook Food). I used a rack in a wok. Once the water reaches a rolling boil, place the pudding into the steamer. Reduce the heat to maintain a very gentle simmer. Steam until an inserted toothpick comes out clean or, preferably, with a few crumbs still attached to it. When the pudding is done, it will be sticky, not wet. This will take between 15 minutes and 1 hour, depending on how thick your pudding is and on how hot your water is. Meanwhile, prepare the warm vanilla butter sauce (see below). The sauce can be made days in advance and simply reheated prior to serving. Once the pudding is done, transfer it to a wire rack to cool slightly as you warm up the sauce. 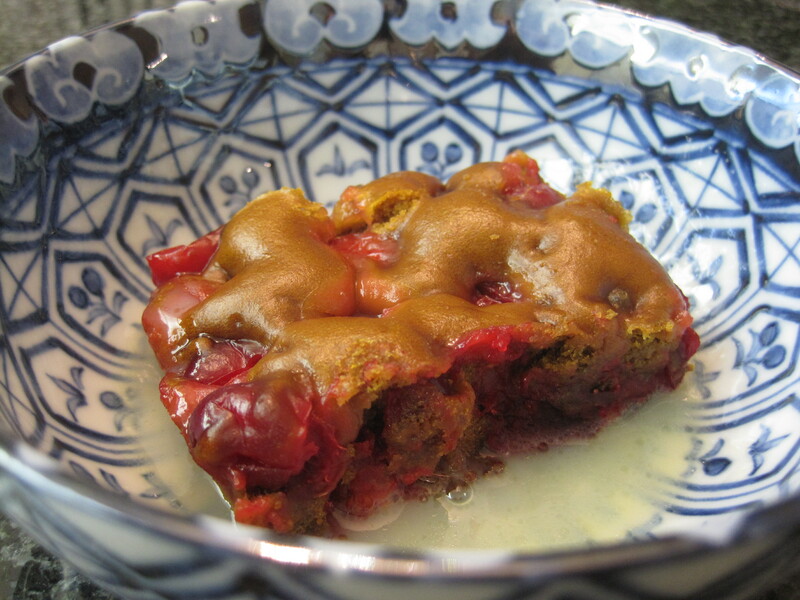 Cut the pudding into squares or slices and plate them onto individual serving plates. Pour the warm vanilla butter sauce around the pudding slices. Serve and enjoy immediately. This steamed cranberry pudding is freezer friendly, as long as it is very well wrapped and sealed. Simply defrost and then reheat in the steamer. This sauce can be made days in advance; adapted from Cranberry Creek Baking Co. In a medium sized, heavy bottomed sauce pot, melt the butter over medium heat. Add the sugar and stir until dissolved. Stir in the vanilla extract and whipping cream if using. Once the sauce is hot, remove it from the heat and serve. Leftover sauce can be stored in the refrigerator once it has cooled completely. Simply reheat and stir prior to serving.